Ahoy! Thanks for stopping by. I’ve been interested in escape rooms since I saw nerd queen Felicia Day tackle one back in 2015. Escape rooms weren’t that popular in the UK at that time, so opprtunities to actually play one weren’t that likely. Then in 2016 the escape room scene came to Wales, UK, with three venues opening up in quick succession. My first room was The Tomb at Escape Rooms Cardiff. The thrill of cracking codes and opening locks became more than a little addicting. Since then, escape rooms have exploded in popularity, with a new room opening every few months. And I’ve made it my mission to play and review every Welsh escape room. Yup, it’s an ongoing battle. All of the reviews here will be for escape rooms located in Wales. They’ll be unbiased and fairly balanced – no escape room is perfect, nor are any completely beyond redemption. I usually play with my wife (Team Lovell) or with some friends at work (Team Screaming Bricks). Though if I’m honest, I’m happy to have a go at a room with any group of enthusiastic nerds. As far as I can do so, all reviews will be spoiler-free. Where this can’t be helped, I’ll clearly state this at the beginning of the review. From 2015-2018 I ran a site called Geeks in Wales, which was about … well, geeks in Wales. The site covered events and geeky goings on throughout Wales, and escape rooms became an increasingly important part of that. I took a break in 2018 on account of having a kid, and by the end of the year I realised that over half of the things I talked about on the site were all escape rooms. 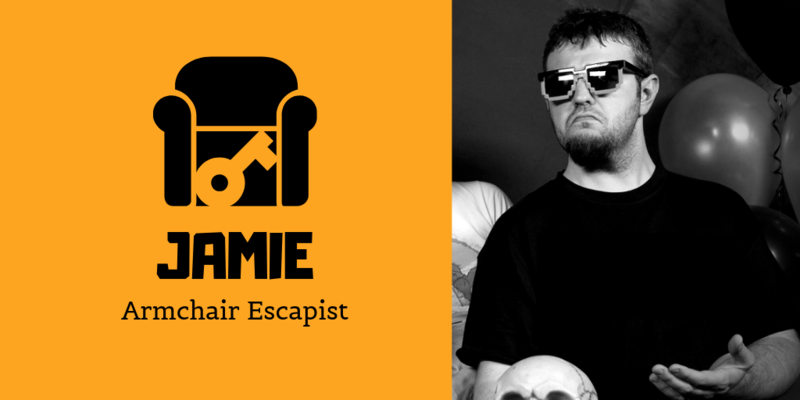 So I made the switch to Armchair Escapist and brought the old reviews over with me.